FORMER UK Farmer of the Year Tony Burgess of Birchgrove Free Range Eggs, near Aberystwyth, is warning of an imminent threat to Welsh egg production. New EU regulations, including a ban on cage eggs, take effect on January 1 and Mr Burgess, who chairs NFU Cymru’s poultry committee, says the Welsh Government should ban imports from producers who fail to comply. “The egg sector is genuinely threatened by imports of eggs from non-compliant EU member states,” says Mr Burgess. Mr Burgess says the sector in Wales is already 96% compliant with the new regulations, and will be fully compliant by the January 1 deadline. “But some of our fellow EU member states can only be described as perhaps not being as efficient or perhaps as rigid as the industry here in Wales, especially in the enforcement department,” he says. Mr Burgess says the three ministers now sharing responsibility for farming and food in the new Welsh Government have had more than two months to study their portfolios. 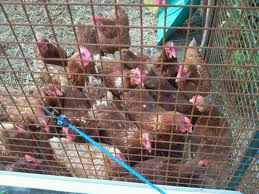 “They now have the knowledge and potential to lead the UK in stating that Wales will implement an outright ban on illegal eggs entering this market place after the January 1 deadline,” he says. Mr Burgess said the threat facing poultry farmers is the same as that which has decimated pig producers. “I’ll wager that people will struggle to name one commercial pig producer and that’s because the pig sector in Wales – much to its credit – has adhered to EU regulation,” he says. “But in turn this has enabled pork production in certain EU countries without such strict enforcement policies to thrive, to the extent that we have more or less exported our production capacity. Mr Burgess says the egg and poultry sector in Wales is often overshadowed by sheep and beef, let alone other distractions such as the Common Agricultural Policy and environmental schemes. He refers to it as “the Cinderella of the agriculture industry” – it seldom gets recognition, let alone the important invitation to the big event. But he says its importance to the infrastructure of the countryside and rural communities should never be underestimated. “In Wales we have an egg sector that is leading the way in alternative production methods. “Free-range egg production has led the way in enabling farms to diversify or enabled those with limited acreage to become viable and Wales leads the UK table in preparation for the cage egg ban in 2012,” he says. And far from being less important than red meat, the sector is hugely important in terms of food security. “I guarantee there are eggs in most people’s fridges, and during any week it’s a firm bet that chicken will be on the menu in many households – both are extremely good value and importantly nutritious products,” he says. “The WWF have an extremely interesting and informative paper on the future of feeding the world population and white meat and eggs are given recognition for the potential they hold for feeding the world’s future population with a high-nutritional, high-calorific and low-carbon footprint food which can be produced on limited acreage.